It's that time of the week. 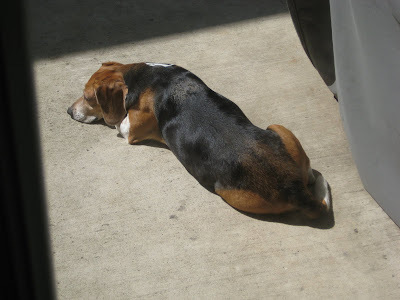 Don't think about the economy or the market for the next few days. We'll be back on Monday AM. Monthly statistics this week included the LEI for September up .3 as expected, but August was revised down to +.1. This means an economy remaining just barely positive going forward. Meanwhile housing starts and permits moved in opposite directions, starts showing strength and permits weakness. 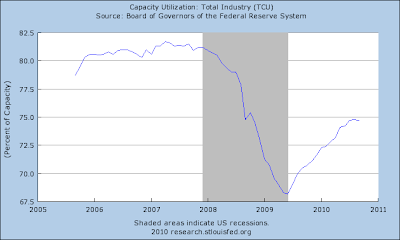 Industrial production and capacity utilization both declined, the former down -.2%, showing the coincident economy in a stall. The Philly Fed index was also barely positive. One piece of good news was the American Institute of Architects index showing expansion for the first time in over two years, adding to the data suggesting that commercial construction will bottom out sometime next year. Let's turn now to the high frequency weekly data. For the first time in over a month, this past week most were soft. The Mortgage Bankers' Association reported that its Refinance Index increased 11.2% from the previous week, losing about 1/2 of the gain from the week before. Refinancing is still proceeding at a fast clip in response to near record low 15 and 30 year mortgage rates. The seasonally adjusted Purchase Index, however, decreased again by 6.7% from one week before, the second steep slide in a row. The purchase index is back near July's lows. This is probably in response to mortgage qualification standards that were tightened earlier this month but is a point of concern. The ICSC reported same store sales for the week ending October 3 declined -0.7% week over week, and were up only 1.7% YoY, the weakest comparison in many months. Shoppertrak did not make a report again this week. Gas prices rose 1 cent to $2.83 a gallon, and at usage at 8.891 million gallons was slightly below last year's 8.950. Gasoline stocks increased again, and continue to be 10% above their normal range for this time of year. Oil retreated to $81 a barrel, still near the upper end of its 6 month range. The BLS reported 450,000 new claims, but last week's 463,000 new jobless claims were revised significantly upward to 475,000. The continually elevated layoffs has been the single most depressing weekly statistic all year. The four week average stands at 458,000. Railfax continued to baseline and intermodal rail traffic improving last week. Economically sensitive waste and scrap metal improved still is running no better than last year's levels. This means there is trend growth but no higher. The American Staffing Association reported that for the week ending October 19, temporary and contract employment declined very slightly -.21% but the ASA says the overall index remained at 100.0, equalling its two year high. M1 declined 1% last week, but was up 0.6% 1month over month, and up about 5.5% YoY, so “real M1” is up 4.4%. M2 increased less than 0.1% last week, +0.7% month over month, and up 3.2% YoY, so “real M2” is up 2.1%. "Real" M2 remains close to breaking out of the "red zone" of +2.5%, which would give us the "all clear" as to any "double dip." Weekly BAA commercial bond rates increased 0.15% last week to 5.74%. This compares with yields on 10 year bonds up +.05%. A smidgen of risk aversion entered the bond market this week. Thirteen days into October, the Daily Treasury Statement is up $97.7 B vs. $84.8 B a year ago, a gain of over 15%! For the last 20 days, receipts are up $132.7 B vs. $116.9 B a year ago, a gain of about 13%. Manufacturing in particular looks to be stalling, and there was some weakness carried over into same store sales, but nothing that qualifies as concern of a double-dip at this point. Purchase mortgage applications will be important to watch next week. 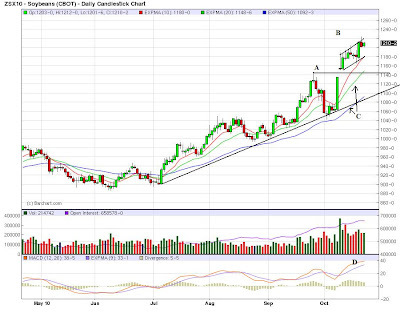 Gold is still in a strong uptrend (A). Along the way, prices have consolidated in downward sloping pennant patterns (B, C and D) -- all standard trading developments. However, notice the 10 day EMA is now moving lower (E) and the MACD has given a sell signal. Also note that prices are now through the 10 and 20 day EMA In short, this is beginning to look like a correction. Manufacturing activity continued to expand, with production and new orders rising across most Districts. Manufacturing activity continued to expand, and several Districts reported gains in production or new orders across a wide range of industries. The only exceptions were the Philadelphia and Richmond Districts, where activity softened compared with the previous reporting period. Exports boosted manufacturing activity according to contacts in the Cleveland, Chicago, and Kansas City Districts. Producers of semiconductors and other high-tech equipment saw continued growth in sales in the Boston, Dallas, and San Francisco Districts. Auto production rose strongly in the Cleveland and Chicago Districts. Metals producers in the Chicago District reported that September sales were the strongest year-to-date, while contacts in the Minneapolis, Dallas, and San Francisco Districts saw only modest gains. Shipments of steel in the Cleveland District continued to be buoyed by demand from energy-related, automotive, and heavy equipment industries. Food processors in the Philadelphia and Dallas Districts noted solid demand for their products, while a few contacts in the St. Louis and Minneapolis Districts reported plans to expand existing operations. The overall tone of the overview is better than expected: manufacturing was expanding; sales are growing; auto production was up strongly, solid demand existed for food processors, St. Louis and Minneapolis are looking to expand operations. This is in contrast to the latest industrial production report which showed a contraction of .2%. The overall index peaked near the 60 level a few months ago and has fallen to the 55 area. However, that is still an area of expansion according to the index. 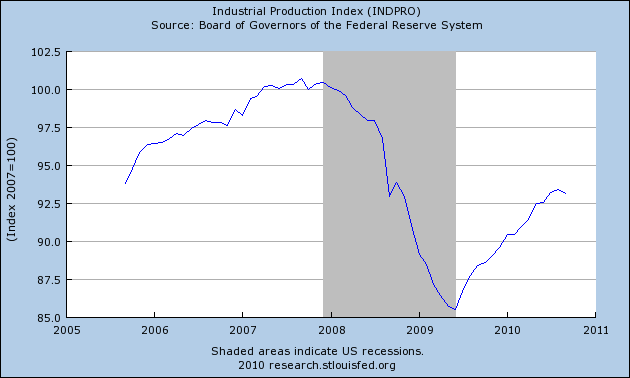 The overall production index is also at high levels and has been there for some time. 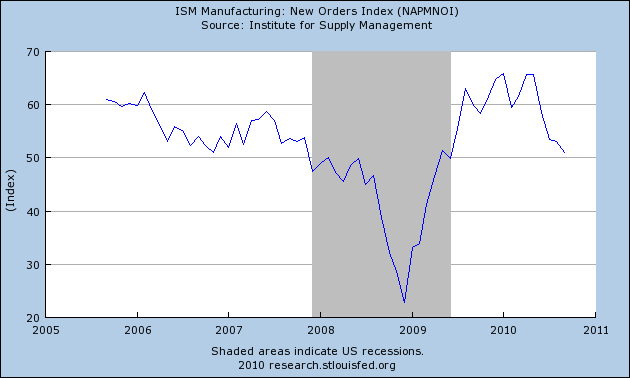 However, the new orders index is near 50 and has dropped sharply over the last few months. 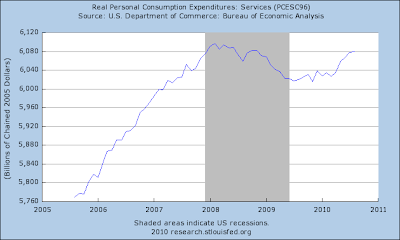 While the number is still expansionary, it is very close to a recessionary reading. 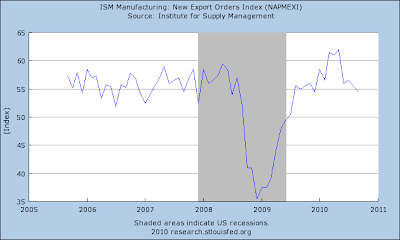 New exports are also at strong levels. While their overall level has dropped over the last few months, they're still at decent levels. The general business conditions index climbed 12 points to 15.7, a clear gain over the relatively low but positive readings seen from July through September. This month, 35 percent of respondents—roughly the same share as in September—reported that conditions had improved over the month, while 20 percent reported that conditions had worsened, a significantly lower percentage than last month. 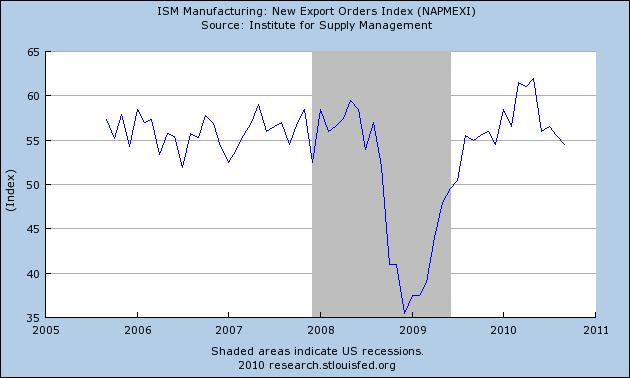 The new orders index moved up 9 points, to 12.9. After turning negative in August and September, the shipments index rose above zero, climbing 20 points to 19.4. The unfilled orders index rose for a third consecutive month, but remained just below zero at -1.7. The delivery time index advanced several points, but also remained negative, suggesting that delivery times continued to shorten. The inventories index turned negative, falling 13 points to -11.7, its lowest level since January, indicating that inventory levels declined over the past month. 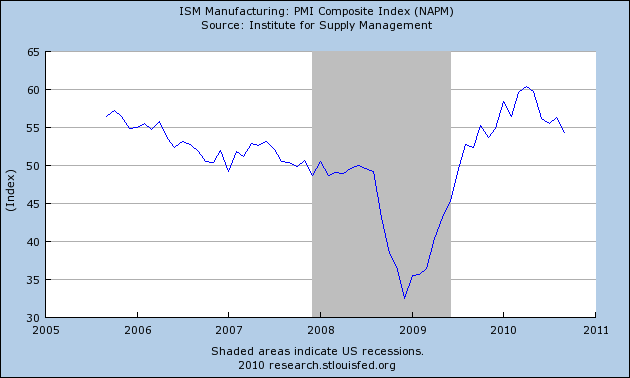 The Mid-Atlantic manufacturing sector continues to sputter. The Philly Fed's new order index, at minus 5.0 in October, continues to show month-to-month contraction though at a slightly slower rate than September's minus 8.1 or August's minus 7.1. Contraction in backlog orders is steady, at minus 8.9 vs. the prior months' minus 8.5 and minus 7.1 before that. Lightness in the pipeline makes manufacturers nervous about inventories. Manufacturing inventories in the region, in contrast to the nation, are coming down fast, at minus 18.6 in October following minus 16.7 in August and minus 11.6 in July. Manufacturers continue to report a lack of pricing power for finished goods with the prices received index down around the 12 level the last three months. Shipments are steady and employment has edged higher the past two months. 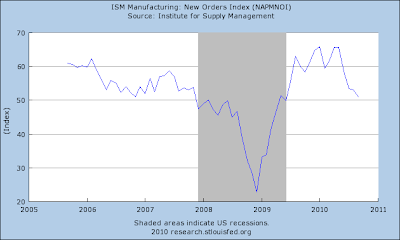 Yet the decline in orders doesn't point to future gains for shipments or employment. A positive not to be overlooked is sudden optimism in the six-month outlook where indications for new orders, shipments and employment all just about doubled in strength. The Mid-Atlantic region may be sagging yet the weakness may be isolated and may only be temporary. Boston: Nearly all contacted manufacturing firms report continued sales growth in the second half of the year after very strong first-half results. One semiconductor firm reports record sales and profitability in the third quarter and other firms selling into semiconductor-related markets also report robust growth. Some of this growth is fueled by strong demand overseas, but some is also coming domestically from the auto industry. Business also remains very strong at a technology services firm. However, a number of firms note that even as sales continue to increase on a year-over-year basis, demand has slowed relative to the first half of 2010. One firm, which manufactures products for the residential real estate market, attributes this deceleration to some of its customers destocking after buying in anticipation of second half demand that never fully materialized; this firm expects sluggish demand going forward. Overall sentiment amongst responding manufacturers is that demand will continue to be subdued for the rest of the year and into 2011, although few, if any, expect conditions to worsen. Philly: Third District manufacturers reported slight decreases in shipments and new orders from August to September, on balance, as well as a decrease in order backlogs. Despite the generally slower activity among the region's manufacturing industries, some sectors reported increases in demand for their products, notably makers of industrial machinery and equipment, producers of wood products, and food processers. Cleveland: Reports from District factories showed that new orders and production rose modestly during the past six weeks. Production was also higher on a year-over-year basis, with many contacts experiencing double-digit increases. Several manufacturers commented that opportunities are growing faster in offshore markets than domestically. Almost all of our respondents expect business activity to follow current seasonal trends for the near term. Most steel producers and service centers reported that volume was either flat or trending up. Shipments are being driven by energy-related, auto, and heavy equipment industries. Two contacts noted that exports are gaining strength. All of our steel contacts expect little change in business activity in the near term. District auto production showed a large increase during August on a month-over-month basis, due to production starts on the 2011 models. In terms of year-over-year comparisons, production was little changed for both domestic and foreign nameplates. Richmond: District manufacturing edged down in September after expanding for the last seven months, with reports of sharp declines that were partially offset by pockets of strength. Several textile and apparel contacts described their business as having "no depth" and noted that their customers expressed uncertainty about the direction of their business. A tire manufacturer reported that a backlog of orders had "tanked" and the company had cut production, noting that he did not expect any improvement for the rest of the year. A manufacturer of exterior doors for residential housing said that his firm had seen a sharp drop-off in orders and shipments over the last several months, with no indication that the trend might reverse. He anticipated that the housing and building products sector would be anemic in 2011. However, a furniture manufacturer reported an increase in orders and noted that his customers said that Labor Day sales were better than anticipated and held up throughout September. In addition, an auto parts supplier stated that orders remained strong and had increased slightly over the last month. Finally, our survey contacts reported that raw materials and finished goods prices, as well as wages, increased at a slower pace than in our last report. Atlanta: District manufacturers indicated that the growth of new orders slowed notably and that production was flat in September compared to the previous month. However, many respondents planned modest production increases in the short-term. Chicago: Manufacturing production increased in September, refreshing from the late summer pause. Several metals manufacturers reported that September sales were the best so far this year. Power generation, mining, and medical equipment manufacturers also reported an increase in orders. In addition, export activity continued to be robust with slower growth in developing countries in Asia and South America offset by strengthening demand from Europe. The automotive and heavy equipment sectors remained strong sources of growth. In contrast, a manufacturer of household appliances noted a reduction in fourth quarter production, and capacity utilization in the steel industry edged lower. Although contacts in some industries indicated that new orders and order backlogs had eased as inventory rebuilding slowed going into early October, manufacturers in general expressed a very positive outlook for the remainder of 2010 and early 2011. St. Louis: Manufacturing activity has continued to increase since our previous report. Several manufacturers reported plans to open plants and expand operations in the near future, while a smaller number of contacts reported plans to close plants or reduce operations. Firms in the detergent, frozen foods, transformer, plastic products, motor vehicle parts, and primary metal manufacturing industries reported plans to expand existing operations and hire new employees. Contacts in the construction machinery, electronic component, and wood product manufacturing industries reported plans to open new facilities in the District as well as hire new employees. In contrast, firms in the appliance, tobacco, chemical, and furniture manufacturing industries announced plans to decrease operations and lay off workers. Minneapolis: Manufacturing output was up since the last report. A September survey of purchasing managers by Creighton University (Omaha, Neb.) showed strong increases in manufacturing activity in Minnesota and South Dakota, and slight increases in North Dakota. In Montana, a food processing company is expanding operations and a jet engine plant plans to build a facility. In Minnesota, a fishing tackle company recently experienced a big pickup in demand, a metal fabricator saw increased orders, a dental part maker noted increased sales and a bed manufacturer's recent sales were up and higher than anticipated. Kansas City: The Tenth District's manufacturing sector reported a mild rebound following softness in the prior reporting period. Factory operators reported expanded production, shipments, and new orders, and firms remained optimistic about future production levels. Despite increased activity, few firms reported planned increases in capital spending or hiring in the coming six months. The rebound in activity produced an increase in backlogs and raised expectations for future backlogs. Some improvement was reported in orders for export markets, though expectations for further expansion remained modest. Inventories of both raw materials and finished goods were reported as in balance with no planned changes from existing levels. The strength reported in manufacturing did not spillover to transportation firms as contacts noted unexpected weakness in activity. Some high-tech firms reported sales growth, but expectations for improvement in the coming two quarters were subdued. Capital spending activity by high-tech firms continued its upward trend but firms reported somewhat diminished expectations for the upcoming six months. Dallas: Most construction-related producers, including cement, lumber and fabricated metals firms, said orders remained flat over the past six weeks. Contacts believe soft demand is related to uncertainty about the economic and political environment. One glass contact said sales rose due to a pickup in apartment construction. Primary metals producers noted a slight uptick in business. Some contacts are selling to new markets, such as solar panel production. Others indicated that remodeling activity had boosted sales. Despite the increase, contacts believe the industry has a long road ahead. Manufacturers of high-tech products said that sales and orders were growing at the same or slightly slower pace since the last report. Most respondents said inventories are below or at desired levels. Sales are expected to continue to grow at a moderate pace over the next six months, but there was increased uncertainty in respondents' outlooks. Paper manufactures said orders were slightly down, in part because customers were managing inventories more tightly. Contacts expect sales growth to be anemic through year-end. Food producers said demand growth held steady. Sales growth of premium items had picked up, but orders for value items weakened. Most transportation manufacturers noted steady demand. Petrochemical producers noted strong domestic demand for most products. Export growth continued to slow, reflecting higher prices, although there were reports of renewed Chinese interest in some products. Domestic orders for PVC used in commercial construction were weak, but exports were stronger, according to contacts. Refiners said conditions continued to weaken. Both margins and operating rates fell since the last report, and gasoline and distillate inventories have risen against seasonal expectations. Frisco: District manufacturing activity expanded further on balance during the reporting period of September through early October. For manufacturers of semiconductors and other technology products, demand continued to grow, although the pace of growth slowed a bit and inventories rose slightly. Extensive order backlogs continued to keep production rates at or near capacity limits for manufacturers of commercial aircraft and parts. Demand firmed further for metal fabricators, although capacity utilization remained well below normal. Activity at petroleum refineries slowed a bit and inventories rose, as seasonal declines in domestic demand were only partly offset by increased overseas demand. Conditions in the wood products industry remained depressed. -- The Richmond and Atlanta Districts are a pocket of weakness, probably due to their mix of manufacturing industries. 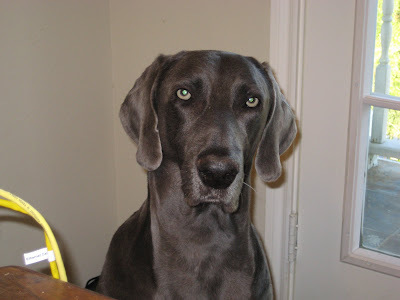 -- On balance, it seems there are more positive developments than negative. But, there is enough weakness for concern going forward. Equity prices gapped higher at the open (a) and then rallied, although by the time they got to point (b) they were clearly over-extended (c). Prices fell, but counter-rallied into the 50 minute EMA (d) and 20 minute EMA (e). Prices next moved through the 200 minute EMA, but staged a late day rally (f). The underlying technicals of the SPYs are strong with the A/D line moving higher (a), the CMF printing positive numbers (B) and the MACD moving higher (c). However, also note the MACD is has recently given a sell signal (c). The Treasury market opened lower (a) and moved lower throughout the day. Prices attempted several counter-rallies (b, c, d, and e), but eventually ended lower, printing a strong downward bar at the end of the day on strong volume. The dollar moved lower at the open, but rallied soon thereafter (b) before closing out in a sideways consolidation (c). Wheat started the rally in grains, with the Russian harvest situation. What prices peaked in early August, but have since consolidated (B). Also notice the EMAs (C) are in a very tight configuration, indicating a lack of direction for the traders. Finally, the MACD is at low levels, indicating there is no momentum in this market right now. 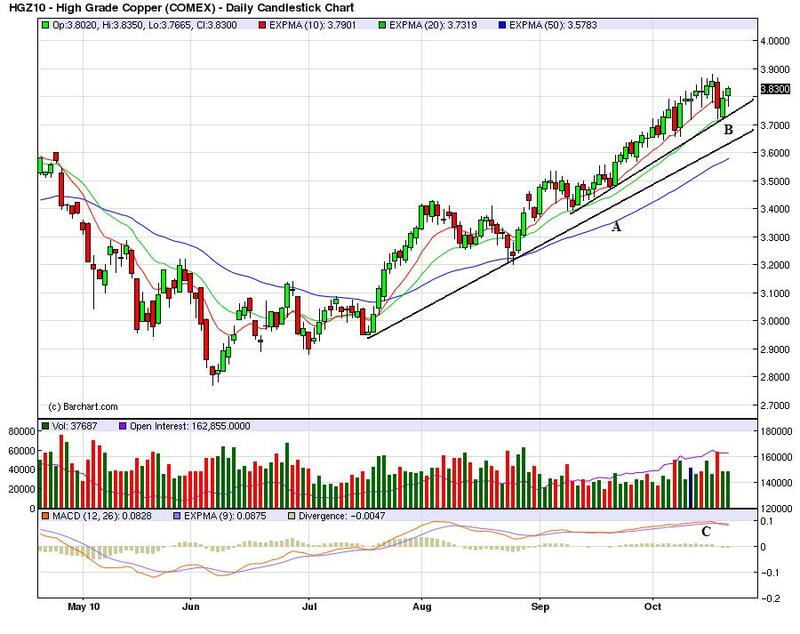 Corn, on the other hand, has gapped higher (A) and is using the 10 day EMA as technical support. The gap is the result of a USDA projection for lower crop yields this year. The EMAs are also strong (B), but the MACD is now moving sideways. 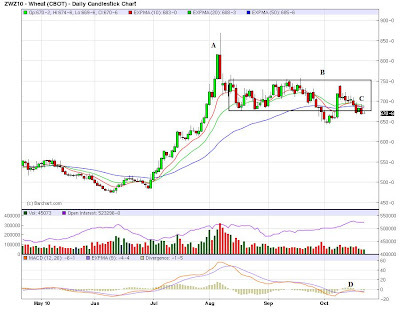 Soy beans have risen in sympathy with corn's spike, moving through key resistance (A) and forming an upward sloping pattern (B). 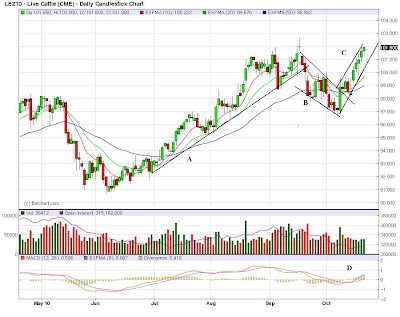 EMAs are bullish (C) as is the MACD (D). Note that only three of the ten components decreased last month, subtracting from the growth. There are two periods of growth for the LEIs. 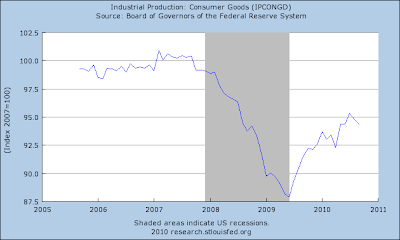 The first is a sharp upward move that started towards the end of the last recession. THe second is a slightly less sharp increase that started a few months ago, and corresponds to a period of slower growth. Retail spending was flat to moderately positive in most Districts, with the exception of the Richmond and Atlanta Districts, which noted declining traffic and sales. Contacts in the Kansas City District noted sales were stronger than expected; back-to-school spending boosted sales in the Philadelphia and Dallas Districts. Retail spending grew modestly in the Minneapolis and San Francisco Districts, and was flat in the Cleveland, Chicago, and St. Louis Districts. Retailers said consumers are slowly regaining confidence, but remain price-conscious and were largely limiting purchases to necessities and nondiscretionary items. There were reports, however, of a pickup in sales of moderately priced household goods in the Philadelphia, Dallas, and San Francisco Districts, and gains in apparel sales were reported in the Atlanta and Chicago Districts. 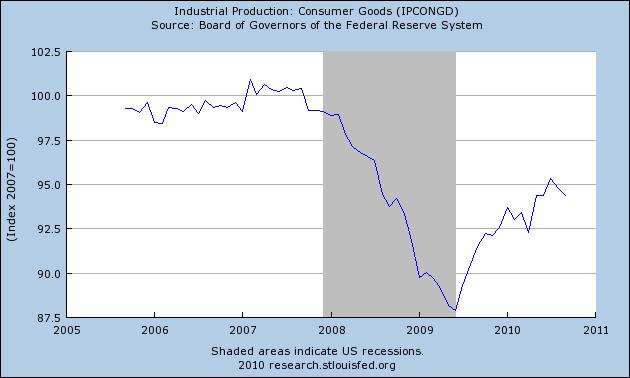 Inventories were at desired levels. Looking ahead, retailers in several Districts expected modest sales growth through year-end. In particular, some contacts in New York planned to add more holiday staff than last year. Most Districts reported that sales of new vehicles held steady or rose during the reporting period. Sales of used vehicles were strong as well. Inventories remained tight, particularly for popular vehicles. Used car prices rose, reflective of solid demand and lean inventories. Respondents' outlooks were for slight growth in sales through year-end. In other words, consumers are generally acting as they should act: they are frugal, looking for bargains and only buying what they need to buy. However, notice that some slightly higher priced luxury goods are entering into consumer purchases. The apparel numbers are confirmed from the retail sales figures, which show a .5% increase from July to August but a .2% decrease from August to September. Also note the inventories are at "desired levels" indicating that inventory restocking for the retail sector is closer to the end than beginning. Real (inflation-adjusted) retail sales continue to increase. 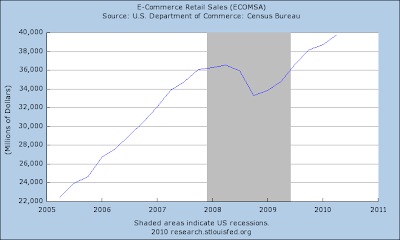 Notice that online sales decreased until about halfway through the recession and then started to increase. 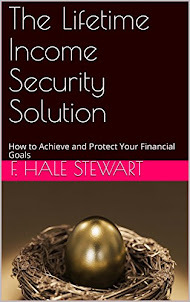 While this area of sales is only 23% of total sales, it is growing in importance. Services account for the largest part of PCEs, coming in at about 66% of PCEs. 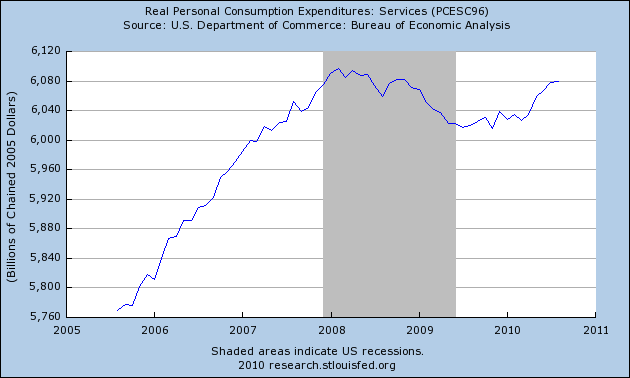 This part of PCEs was flat for the first part of the recovery, but has since rebounded. 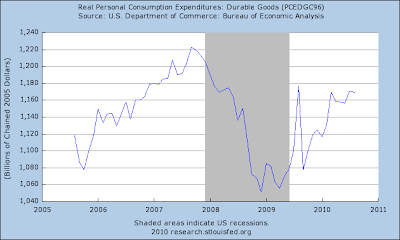 Non-durable goods purchases are near pre-recession levels. Durable goods purchases -- the smallest part of PCEs, have stalled for the last few months. Boston: First District retailers report mixed sales results for September and early October. Year-over-year same-store sales range from decreases in the low single digits to increases in the mid single digits. Contacts note that consumers are increasingly responsive to "getting a good deal;" those with increases attribute the uptick in sales to strong marketing, promotional activity, or stocking "the right mix of products" at discounted prices. NY: General merchandise retailers report that sales have been mixed since the last report, with same store sales running roughly on par with a year ago and on or close to plan in September. Stores in Manhattan fared somewhat better than in the rest of the region, evidently helped by brisk tourism. One major retail chain notes that sales of seasonal apparel were sluggish due to unseasonably mild weather but that sales in most other categories were fairly good; this contact expects holiday season sales to be up roughly 3 percent from 2009 on a same-store basis. Another contact at a major mall in upstate New York indicates a sharp uptick in sales toward the end of September. Some New York State retailers express concern about the recent reinstatement of the state sales tax on clothing under $110, though it is too early to gauge any effect on sales. Inventories are generally reported to be at favorable levels, while prices remain steady; merchandise acquisition costs have also been steady. A few major retail contacts indicate that they plan to hire more holiday-season staff than in 2009. Auto dealers in upstate New York report that sales of new vehicles held up fairly well in August and September, though the cash-for-clunkers program last summer adversely affected year-ago comparisons. Sales and prices of used cars have reportedly been buoyed somewhat by strong demand and lean inventories of new vehicles. Auto dealers report continued improvement in credit conditions. Philly: Third District retailers reported modest year-over-year gains for the back-to-school shopping period, and most of those contacted for this report said sales have continued to move up in recent weeks. Some store executives noted that customer traffic and discretionary spending appeared to be increasing somewhat. One said, "Sales of home goods have begun to pick up, as well as sales of things that are not necessarily must-have, but the price has to be right. The consumer is incredibly price-sensitive." Looking ahead, most of the retailers contacted for this report said they expect sales to continue to increase at around the current growth rate through the end-of-year shopping period. Most agreed that stronger growth will not set in until economic conditions, particularly employment, show clear evidence of significant improvement. Third District auto dealers reported steady sales during September at a rate slightly above the year-ago pace. Inventories were generally described as light, and supplies of popular models were said to be particularly lean. Dealers expect sales to improve slowly during the rest of this year and into next year. Cleveland: On balance, there was little change in retail sales for the period from mid-August through mid-September, when compared to the previous 30-day period. Consumers remain price sensitive and focused on buying necessities. When given the option, they prefer private-label to premium brands. Retailers expect conservative sales growth at best, going through the holiday season. Several retailers noted modest price increases from their suppliers, which they passed through selectively to consumers. Half of our contacts reported on plans to increase capital budgets in 2011 relative to this year. Hiring will be limited to temporary holiday workers. Auto dealers characterized new vehicle sales during August as decent, although they were slower than those seen during the peak summer season. Many sellers reported that August sales were down compared to year-ago levels due to the cash-for-clunkers program. Looking toward the year's end, dealers expect modest sales increases at best. New car inventories remain on the light side, especially for popular models. Used vehicle purchases have picked up since our last report, although supplies are tight and prices remain high. The number of financing options is growing across the District, and pricing is competitive. Still, credit standards are tight, and potential buyers often find themselves unqualified for the vehicle they want to purchase. The incremental hiring at auto stores that began in mid-summer has tapered off. Richmond: Retail activity generally softened since our last report, although a few contacts reported an uptick in sales. Several building supply retailers reported declining sales revenues, while a central North Carolina discount department store manager described sales revenues as "steady." A store manager in West Virginia indicated that back-to-school sales were "good, but not shooting off rockets," and a North Carolina department store wholesaler said business had picked up. However, a North Carolina furniture store manager said that local unemployment was causing him to sell at close to cost. Indeed, big-ticket sales, particularly among automobile dealers, fell sharply in our most recent survey. One exception was a car dealer in West Virginia, who reported that sales rose modestly. Recently polled retailers noted flat or declining customer traffic, although a representative of central Virginia merchants reported a modest increase in credit card use. Price growth strengthened somewhat at retail establishments, according to our District survey, while growth in average wages was little changed. Atlanta: Most District merchants reported that traffic and sales decreased in September and that they are intentionally keeping inventory levels low. Contacts noted that low-end products and apparel were strong sellers, however, and the outlook among retailers improved only modestly from previous reports. District automobile dealers indicated that vehicle sales were ahead of year-ago levels. 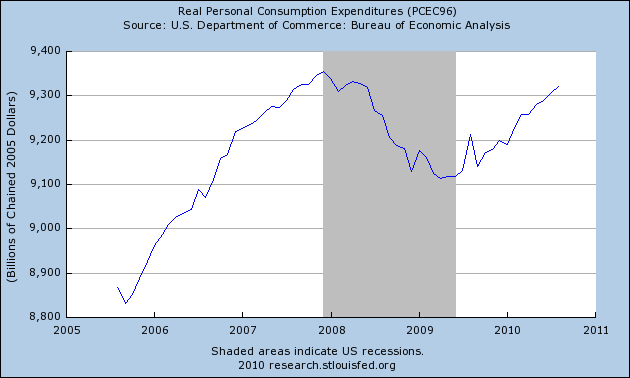 Chicago: The pace of consumer spending was little changed from the previous reporting period. Contacts indicated that consumers were slowly regaining confidence, although they remain very price-conscious. As such, promotions and sales persisted as the primary driver of traffic in stores and showrooms. Retail sales excluding autos in September were nearly on par with the August sales pace. Clothing items continued to sell well, as did electronics and appliances; but furniture sales were again weak. Auto sales held steady even as fewer incentives were offered and access to credit continued to slowly improve. Minneapolis: Consumer spending grew moderately. A major Minneapolis-based retailer reported that same-store sales in September were up about 1 percent compared with a year earlier. September traffic at a North Dakota mall was up over 10 percent from a year ago, which was a surprise following a slight decrease in August, according to the mall manager. Cooler fall weather seemed to attract shoppers. August sales were up over 10 percent at a Montana mall after a few consecutive months of small gains. August sales were up slightly from a year ago at a Minneapolis-St. Paul area mall. A restaurant chain noted that sales were up 3 percent during August and September from a year earlier. However, a Minnesota-based clothing retailer noted slow uptake of new merchandise offerings; it expects low single-digit increases in same-store sales over the next few months. September car sales in Montana were mixed, according to a representative of an auto dealers association. KC: District retailers reported stronger than expected sales in September and indicated sales were higher relative to last year. Retailers remained optimistic that sales would continue to increase in the coming quarter but expected softness in selling prices. Restaurants reported much higher sales than a year ago and anticipated future sales gains going forward. The average check amount at restaurants remained flat, although menu prices increased. Automobile sales weakened considerably from the last reporting period but remained slightly above year-ago levels. Auto inventories continued to decline and dealers expressed satisfaction with current inventory levels. The lodging industry noted improved hotel occupancy rates with mountain resort bookings above year-ago rates. Some hoteliers indicated that the occupancy bounce was likely seasonal in nature but reported improved expectations for both occupancy and room rates. Dallas: Back-to-school spending led to a pickup in sales over the reporting period, however customers remain extremely price conscious. Consumers continue to focus on non-discretionary goods, but contacts noted there was an uptick in spending on medium-priced household goods. Eleventh District sales trended roughly in line with the nation during the reporting period. Contacts expressed caution in their outlooks and said competition remains fierce. Frisco: Retail sales remained sluggish but improved somewhat on balance. Both traditional department stores and discount retail chains reported modest improvements in sales, although somewhat elevated inventories were noted; moderately priced items such as selected home and garden products reportedly saw the strongest gains. By contrast, retailers of major appliances and furniture reported a further slowdown in activity and expressed pessimism for a reversal over the remainder of the calendar year. Grocery sales were characterized as largely flat, with consumers focused on bargains, and grocers do not anticipate any change in customer buying patterns for the foreseeable future. Sales of new domestic and imported automobiles improved a bit, with dealers citing replacement of broken-down or leased vehicles as key motivating factors for purchases. Several districts mentioned that consumers were expanding their purchasing to non-necessities, although the increase seems to be cautious. Cleveland, Richmond and Atlanta are a source of weakness for the economy; retail activity in these areas was weak. "Price conscious" was used by several districts, indicating consumers are still wary about making big purchases. Minneapolis showed some incredibly strong numbers. The Fed released the Beige Book earlier this week. 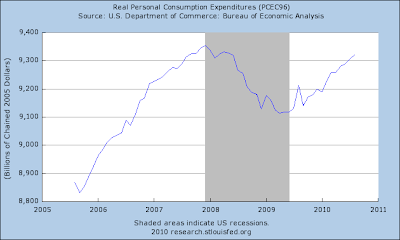 It essentially says we're in for more of the same -- slow growth. Reports from the twelve Federal Reserve Districts suggest that, on balance, national economic activity continued to rise, albeit at a modest pace, during the reporting period from September to early October. Manufacturing activity continued to expand, with production and new orders rising across most Districts. Demand for nonfinancial services was reported to be stable to modestly increasing overall. Consumer spending was steady to up slightly, but consumers remained price-sensitive, and purchases were mostly limited to necessities and nondiscretionary items. New vehicle sales held steady or rose during the reporting period; sales of used automobiles were strong as well. Activity in the travel and tourism sector picked up. Housing markets remained weak with most Districts reporting sales below year-ago levels. Reports on prices suggested stability, however. Conditions in the commercial real estate sector were subdued, and construction was expected to remain weak. Lending activity was stable in most Districts. Agricultural conditions were generally favorable, and above-average yields were expected in most reporting Districts. Activity in the energy sector continued to expand. Input costs, most notably for agricultural commodities and industrial metals, rose further. Shipping rates increased, and retailers in some Districts noted rising wholesale prices. 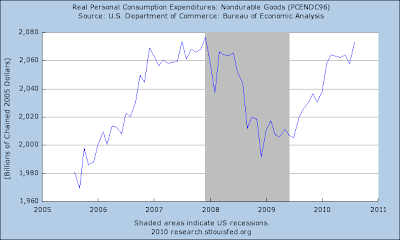 However, prices of final goods and services were mostly stable as higher input costs were not passed on to consumers. Wage pressures were minimal. I'm going to take a look at the data in a sectional way over the next few days. Yesterday, stock prices opened higher (a) and rallied for most of the morning (b) using the EMA as technical support. Prices consolidated gains in the afternoon (c), although there was an attempted sell-off at the end of trading on increasing volume. 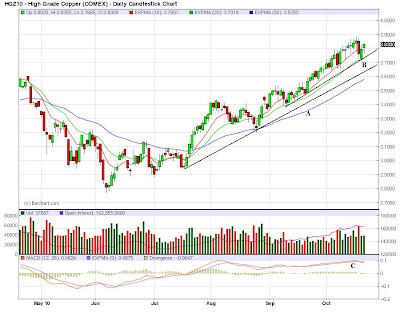 On the daily chart, prices printed a very strong bar yesterday, and are clearly in a strong uptrend (a). Also notice the EMAs are in the most bullish orientation possible -- the shorter are above the longer and all are moving higher. The Treasury market opened lower (a), but then moved higher, hitting resistance in the area of previous highs from yesterday (b. Prices sold-off in the afternoon in a disciplined downward move (c). On the daily chart, notice that Treasuries have broken two uptrends -- the first (a) started about six months ago and the second over the last month (b). However, prices are now moving sideways, largely as a result of QEII from the Fed. 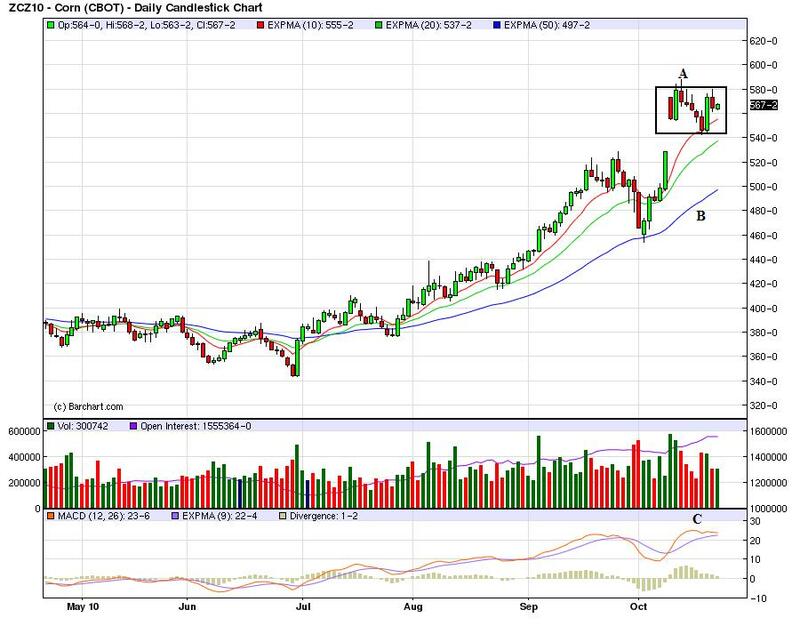 The dollar has hit resistance at the 20 day EMA and moved sharply lower yesterday. This is to be expected, especially with QEII on tap. 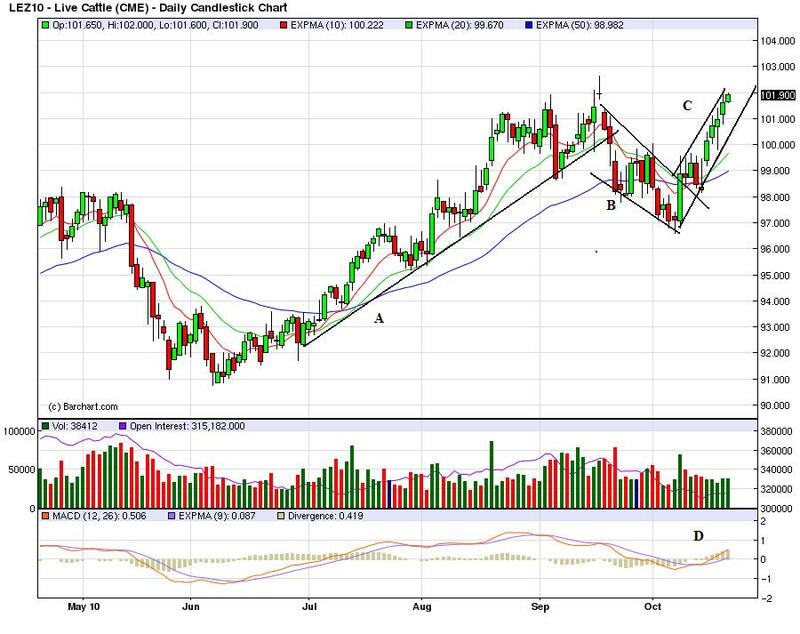 Cattle is in an up (A), correction (B) and up (C) pattern with a buy signal from the MACD (D). The USDA's announcement that downgraded this years corn crop is added an upward bid to corn, which is the primary feed for cattle. More expensive food = more expensive cattle. Copper is still in a very strong uptrend, with two primary trends supporting prices (A and B). However, the MACD has just given a sell signal (C). This bodes well for the economy, as copper is a basic ingredient in most everything. QEII is a big story driving all the markets right now. It implies more stimulus is on the way, which is bullish for stocks. It places a bid in the Treasury market which is bullish for bonds, but it is bearish for the dollar, which in turn is bullish for commodities. I pointed out that state sales tax receipts were,in fact, increasing. Mish still refused to acknowledge the data, citing several states' and municipalities' tax increases (some of them not even sales tax increases). Well, yesterday the Rockefeller Institute published its final report on state finances during the April - June 2010 quarter, headlined "Sales Tax Gains 5.7 Percent in Second Quarter." Here's the raw data, from page 17 of the report: Sales tax receipts in the 2nd quarter of 2010 totaled $61.171 Billion, vs. $57.897 Billion in the second quarter of 2009, a gain of $3.3 Billion, or 5.65% (rounded to 5.7%). respectively, while the corporate income tax declined by 18.3 percent. During the April-June 2010 quarter, enacted tax changes increased state revenue by an estimated net of $4.9 billion compared to the same period in 2009. Personal income tax increases accounted for approximately $2.7 billion and sales tax for approximately $1.6 billion of the change. In a single state, California, legislated changes increased personal income tax and sales tax collections each by an estimated $1.1 billion. Legislated changes in New York were also significant for the personal income tax. Most of the increase in sales tax was due to legislated changes in California, Massachusetts, and North Carolina. [Note: The tables on p. 17 of the report indicate that these three states contributed $1.4 billion of the $1.6 billion increase due to tax rate increases] The net impact is that the increase in nominal tax revenue would instead have been a small decline, if not for the legislated tax changes. Subtact the $1.6 Billion in state sales tax increases from the $3.3 Billion gain, and you have a net $1.7 Billion gain in sales tax receipts ex-tax rate increases, or +2.9%. 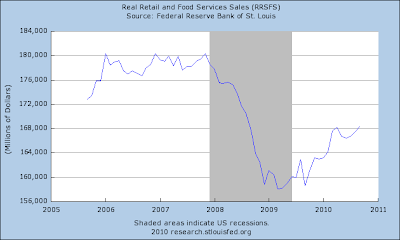 As of June 30, 2010, YoY CPI was up 1.1%, meaning that the "real" YoY sales tax increase from the second quarter 2009 was 1.8%. [E]ven if sales taxes precisely mirrored retail sales, they would be weak compared with two or three years ago. In fact, though, many state sales taxes exempt food and otehr necessities and exempt or exclude many services, relying more heavily on non[necessities. Many of these ... are far easier to do without or postpone.... They tend to ... suffer greater declines in business downturns. Game. Set. Match. The debate about increasing real sales tax receipts is over. Oil is an incredibly important commodity. When it's price rises to incredibly high levels it, it usually leads to a recession; in fact, a price spike in oil (the early 1990s and 2008) has preceded two of the last three recessions. Hence, some idea of where it's price is headed can help us understand where the economy might be headed. Prices have stayed in a fairly steady and constant range for most of the year. Now there is a debate emerging about what will happen to oil prices in 2011. Crude could enjoy its biggest annual increase in demand for three decades. A sustained economic recovery should support oil consumption next year, too, drawing down global oil inventories and forcing Opec, the oil producers’ cartel, to increase production, says Goldman. It is not the first such forecast. Indeed, talk of $100 a barrel oil was first heard in April, when crude rose as high as $87 a barrel. That was premature but other banks are also forecasting higher prices. Barclays Capital says that risks “are continuing to build towards the upside”. Yet many dealers in the physical markets, as well as officials at the International Energy Agency, the western countries’ oil watchdog, believe the bulls are wrong. The spot market, they say, is oversupplied and that puts a price ceiling on oil. “At the risk of appearing a ‘party pooper’ for market bulls, our prognoses still suggest to us that benign market fundamentals could persist well into 2011,” says the IEA. Mr Taylor argues that the concept of a price ceiling exists today in a way it did not when prices rose to $150 in 2008, before the effects of the financial crisis and the worst recession in decades sapped demand. His and the IEA’s view is shared, privately, by other leading energy traders. Together, Vitol, Glencore, Trafigura, Mercuria and Gunvor dominate oil trading and, arguably, have better intelligence than anyone else about the state of the physical market. Other banks, including Société Générale, Deutsche Bank and JPMorgan are cautious about the outlook for oil, looking to a ceiling of about $90 a barrel over the next year. What happens to oil prices will test whether the stability in the market since January – oil has traded at between $70 and $85 a barrel for 95 per cent of the year, in spite of sharp rises in other dollar-denominated commodities – is here to stay. For the four years up to 2008, oil was highly volatile. Opec, one of the most important actors in the market, believes prices have found a new stability. Saudi Arabia, the cartel’s de facto leader, is working hard to keep oil within the $70-$85 range. This “steady-as-it-goes” outlook is based on benign fundamentals. The IEA, like many of the big traders in the physical market, is forecasting that oil demand growth will slow next year to 1.2m barrels a day, down from 2.1m b/d in 2010, due to slowing usage in Asia, particularly China, the former Soviet Union and the US. However, the real wild card will be China and India; as their economies grow, their demand will be the real driver of prices. Austerity measures aimed at bringing down Portugal's towering budget deficit are crucial to regain creditor confidence, Finance Minister Fernando Teixeira dos Santos said Saturday, while also acknowledging that they will slow down economic growth next year. Measures contained in the government's 2011 budget proposal are intended to "not only reduce the deficit, but will also regain the confidence of those who lend to Portugal," Mr. Teixeira dos Santos said at a news conference explaining the proposal, which the minority government late Friday had presented to parliament amid continued uncertainty on its approval. The government expects gross domestic product in Portugal to recover by 1.3% this year, but the harsh austerity measures included in the proposal will contribute to a slowdown in GDP growth to 0.2% in 2011, Mr. Teixeira dos Santos said, because the measures will have an effect on domestic demand. The government's growth forecasts are still slightly above those of the Bank of Portugal, which said last week that it expects a GDP expansion of 1.2% this year, and a stagnation next. Prime Minister Jose Socrates had earlier proposed a series of harsh austerity measures for this year and next, aimed at cutting Portugal's budget deficit from 9.3% of gross domestic product in 2009, to 7.3% this year, and 4.6% in 2011. The goal is to reduce the spending gap to 2.8% of GDP in 2013. So, a country that is barely growing is going to cut spending so that it can lower its already low growth rate to near 0%. In other words, the country is voluntarily inching itself toward a recession -- at a time when it is just getting out of a recession. This at a time when there is ample data from other countries that have tried austerity that this is not a good time (see links above) to engage in austerity. Britain will take an axe to its welfare state on Wednesday as part of an 80 billion-pound ($125 billion) cut in public spending that will dictate the future of both the economy and the coalition government. After months of bitter negotiations, Conservative finance minister George Osborne will announce his spending review at 1130 GMT (7:30 a.m. EDT). Cuts of 25 percent on average are in store for most government departments outside priority areas. Economists are split between those who say the drastic action is needed and those who argue it will tip Britain back into recession. Almost all agree, however, that growth will slow and the Bank of England (BoE) will have to keep monetary policy super-loose for the foreseeable future. Equity prices opened lower, but rallied. 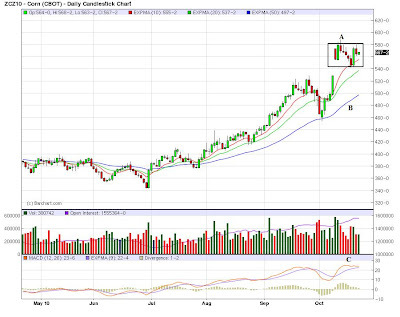 However, after getting beyond resistance at the 20 minute EMA (b) they hit resistance at just above the 200 EMA (c). Price then fell, eventually hitting support at point (d) at level (e). Prices crashed through this level. They attempted to rally a bit after, (g), but managed no strong gains. Yesterday, stock prices closed just below key technical levels (a). In contrast to equities, bonds rallied, forming two upward trends (a and b), consolidating gains along the way in downward sloping pennants (c). The dollar gapped higher at the open (a) and then moved slightly higher (b). Yesterday, the dollars spike higher ran into resistance at the 20 minute EMA. Also note the volume spike over the last few days. The dollar's underlying technicals are strong right now. The A/D line shows a flow of money into the security, the CMF is just turning positive and the MACD is about to give a buy signal. However, given the Fed's QEII policy, this is most likely just a counter-trend rally that will hit resistance at an EMA of Fibonacci level. Commodities gapped lower at the open, rallied to between the 20 and 50 EMAs (a) and then sold off (b) for the remainder of the day (b). On the weekly chart, the market is at important technical and Fibonacci levels. 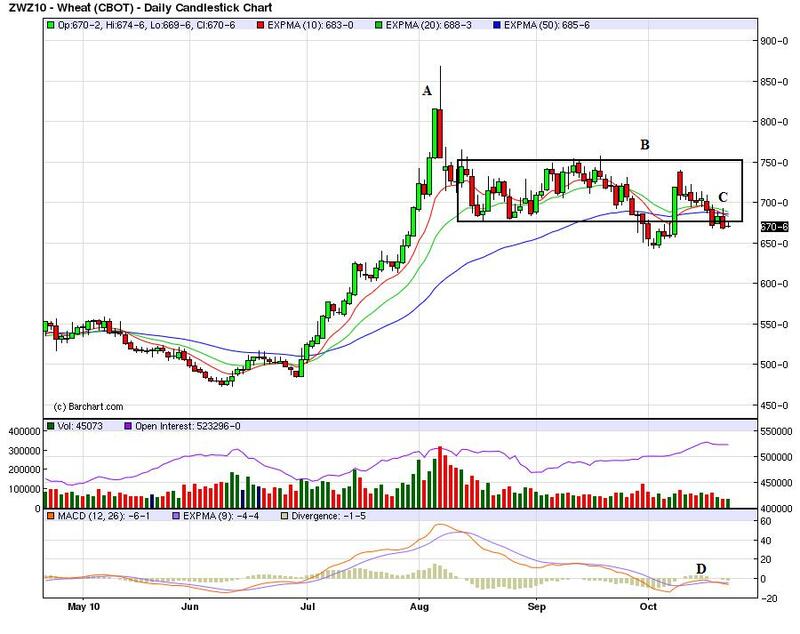 We can see the recent rally in more detail on the daily chart. The rally is sharp (a) and has recently retreated from important levels (b). Today China announced it would increase a key interest rate. This is obviously a short-term negative. But over the next few weeks -- given China's growth rate -- I wouldn't be surprised to see this index move through key resistance. Yesterday's drop in IP indicated the slowdown is continuing. Notice the index for IP has been increasing for over a year. In other words, the overall trend is still up. However, as noted above, there are signs of a slowdown. 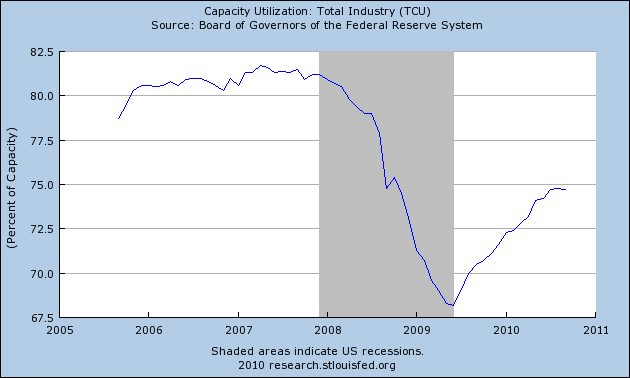 Above is a chart of capacity utilization, which also shows a strong rebound from the lows of the recession. However, the overall level is still very low and the last month of data produced a sideways move. 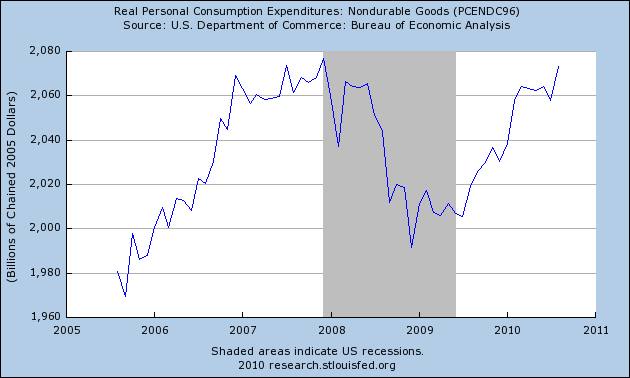 The output of consumer goods declined 0.4 percent in September. The index for consumer durables decreased 0.9 percent. the production of miscellaneous goods declined for a second consecutive month. The output of home electronics rose 0.6 percent. 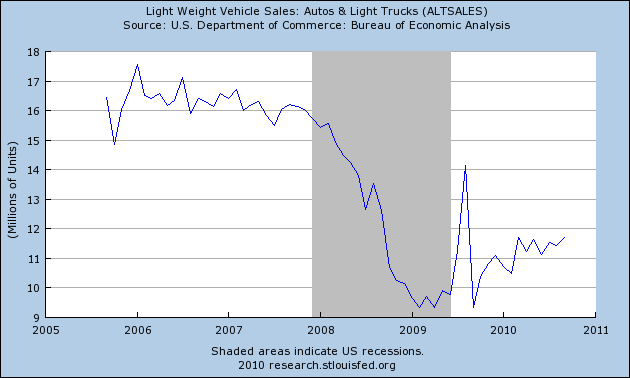 The above chart of auto and light truck sales shows that demand has rebounded somewhat, but not as strongly as we would like. 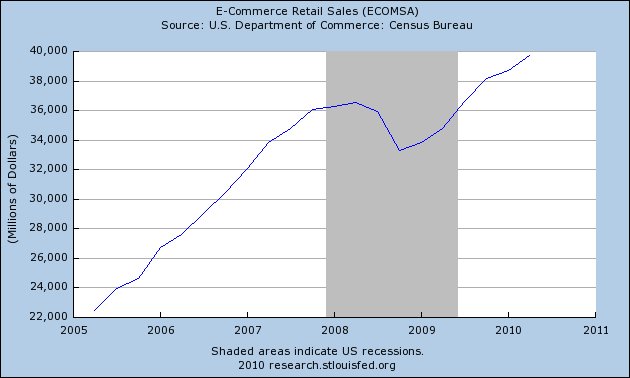 It also shows the pace of purchases has been more or less constant for the last approximately six months. Obviously, the slowdown in the housing market is having a very negative impact on the household furnishings market. Notice the overall trend is still up. In addition, we've seen several 1-2 month drops over the last year and a half without making the overall trend move lower. The production of nondurable consumer goods moved down 0.2 percent; a fall of 1.9 percent in the energy category, which primarily resulted from a decrease in the index for residential utilities, more than offset an increase in the non-energy category. Within non-energy nondurables, the indexes for foods and tobacco and for clothing moved up, while the indexes for chemical products and for paper products moved down. The output of consumer goods increased faster in the third quarter than in the second quarter, a pickup that reflected unusually strong summer sales by utilities and a jump in the output of consumer automotive products. The non-durable slowdown was caused by a drop in utility output. This shouldn't be surprising considering the summer is now over. The overall output in consumer goods is interesting, although utilities are a part of that. However, car sales were also a contributor, which is encouraging. Let's move onto business output. 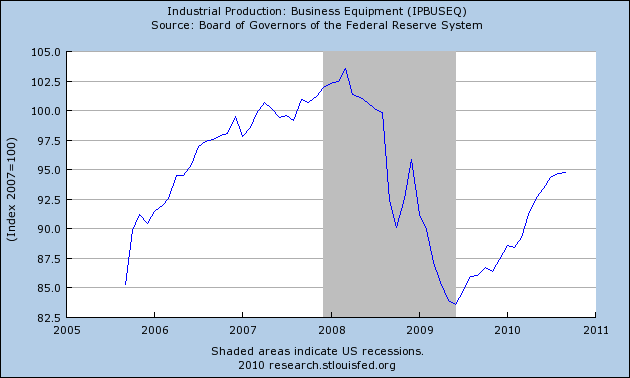 The output of business equipment edged up 0.1 percent in September and was 10.1 percent above its year-earlier level. The index for transit equipment advanced 1.8 percent and offset a decline in the production of information processing equipment; the output of industrial and other equipment was unchanged. 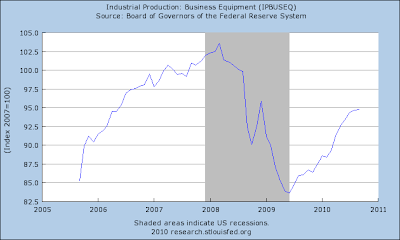 For the third quarter, the output of business equipment rose at an annual rate of 9.8 percent. This increase was slower than in the second quarter due to substantial decelerations in the indexes for information processing equipment and for industrial and other equipment. In contrast, the output of transit equipment jumped at an annual rate of 33.4 percent in the third quarter after having fallen the previous two quarters. Notice the overall trend is still higher, although the pace of the increase is still lower. The index for defense and space equipment declined 0.2 percent in September after a 0.5 percent decrease in August. The production of construction supplies retreated 0.8 percent in September after having advanced 1.1 percent in August. The index for business supplies decreased 0.9 percent in September, with declines in both the energy and non-energy categories. In September, the production of materials was unchanged from August. A decrease in the output of durable materials offset increases in the indexes for nondurable materials and for energy materials. The decrease in durable materials was its first decline since June 2009, and the indexes for all of its major categories moved down. For the third quarter as a whole, the output of materials rose 4.9 percent, somewhat less than the 7.5 percent advance recorded in the second quarter; relative to the second quarter, slower increases in durable materials more than offset faster gains for nondurable materials and for energy materials. For a better gauge of construction materials, keep an eye on lumber futures; that's where the first big moves for a housing rebound should occur. 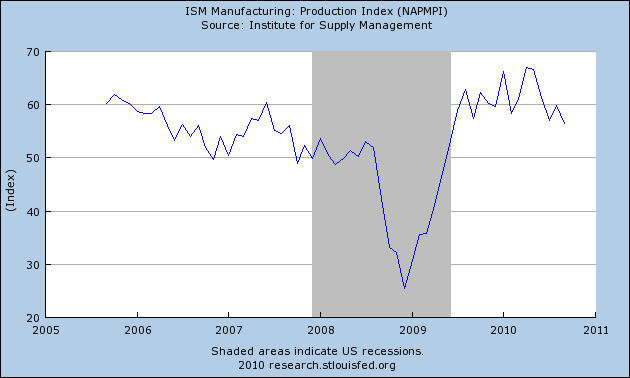 The conclusion from yesterday's report is the same as a few weeks ago: manufacturing is slowing. However, I still think that the worst we'll see is production floating around 0. Through mid-April, it was showing stronger "leading" growth than in any recovery in 30 years. But GDP for the second quarter came in at less than 2%, and the third quarter might even be less. That isn't what I'd call "leading." Citing that issue, back in early July, noting that virutally all economic data seemed to turn down in unison at the end of April, I highlighted 6 "harbingers of the second half stall:" (1) the Shanghai stock index; (2) Bond yields correlation with stock prices; (3) Price growth exceeded wage growth; (4) Real M1 and M2 money supply stagnant or shrinking; (5) Decline in housing permits and purchase mortgage applications; and (6) Oil prices at 4% of GDP. Since then, it became clear that there was another harbinger, namely (7) rising Libor index. These 7 items all deteriorated before the broad mass of data was hit. This morning's data is curious. Permits fell to 538,000, which is close to their 2009 lows. On the other hand, Starts - which typically follow permits closely, sometimes with a one month lag, at 610,000 were among the highest readings in two years. This is quite an anomaly and it will be interesting to see the revisions next month. Note: in the above graph, whenever the blue line has exceeded the red line, that means Oil prices have exceeded 4% of GDP. 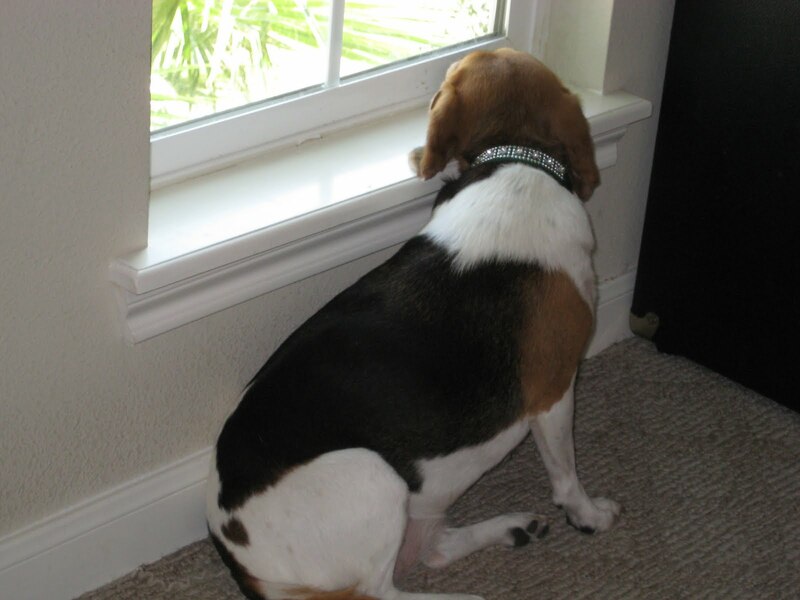 In summary, none of our harbingers indicates any further weakening of the economy. In fact, most of them are suggesting short term strength ahead. Yesterday's poor industrial production reading, a classic coincident indicator, is the fruit of the flatlining LEI of this spring, not a foretelling of next spring. 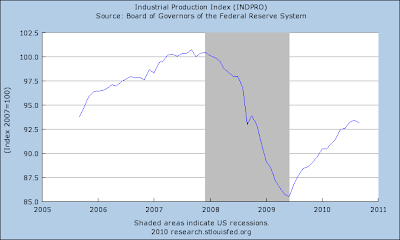 Longer term, Oil prices are still a choke collar on economic growth, and "real" wage growth is pathetic at best.